Browse our commercial vehicles ready to get the job done for you with exceptional towing power and max payloads as well as available features like RAM BusinessLink. 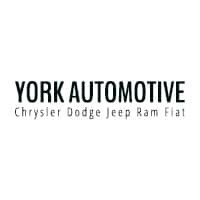 Stop by York Chrysler Dodge Jeep Ram FIAT near Lafayette and our trained staff will help find the right commercial vehicle for your business needs. *2018 & 2019 Ram 1500 Classic Tradesman Crew Cab with 4x4 Package - 0% APR for 72 mos. - On select models for well-qualified buyers with approved Chrysler Capital Financing; requires first payment plus taxes, $17.50 title and $199.00 doc fees. APR monthly charge is per $1,000 financed; not all buyers will qualify. All advertised specials are on in-stock units only; not valid with any other offer or discount; vehicles subject to prior sale; vehicle image for illustration purposes only; shown with options. See dealer for full details. Expires 4/30/19.